Judge Judy, Channing Tatum, Bourbon, Jimmy Choo, Cheetos & Ryan Ghosling…what do they have in common? They are some of the things that authors are thankful for. I’m also thinking this blog title could be a movie. Picture it:Judge Judy presides over a case where Channing Tatum is charged with drinking bourbon while wearing Jimmy Choo’s and tossing Cheetos at Ryan Ghosling. Yes? No? Perhaps that could be a blog post for another day, but this week it’s all about YOU. Yes. YOU. It goes without saying that I (as well as my fellow authors) are grateful for our families, friends and our creative gift. We are also extremely thankful for all of YOU book lovers; readers, bloggers, librarians, book sellers. 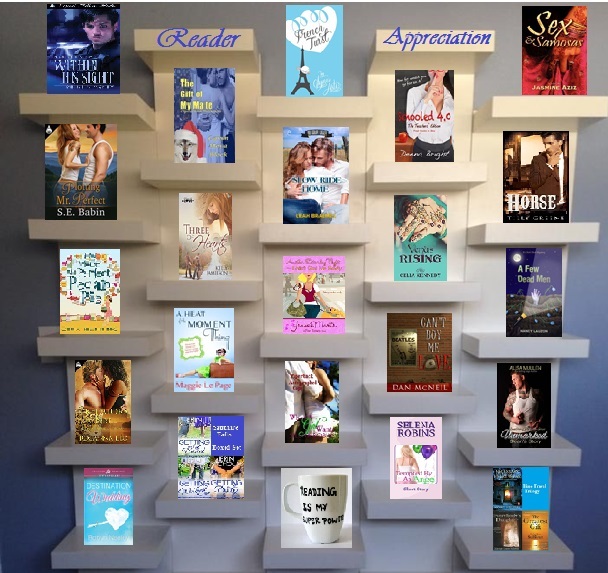 We are happy to welcome you all to the READER APPRECIATION EVENT, gifting books in a variety of genres. Meet the Authors and their contribution to the event. “I want something from you, too,” Margot said. “You, woman, are playing with fire,” Mathis said pushing into her hand.